The piano piece entitled Angel consists of three 3-part dance impressions, or better called dance improvisations. Dark, somber, but not without hope, Angel is the intensely intimate setting for the incomparable expression of this divergence. Originally written for just piano and bandoneon, the Cuatro Estaciones porteñas (Four Seasons) were further condensed by their “reduction” for solo instrument. (The arrangement of “Primavera porteña,” Spring, is by Stephan Arnold.) The reduction escalates the level of virtuosity beyond even that of the original, but not merely for show. To Bartók, inspiration was less important than conceptualization. He succeeded in achieving an initial synthesis in Suite op. 14. He neither quotes nor merely arranges. Instead, he finds a form of expression all his own by integrating folk-song-like elements into “elevated” musical language. The Improvisations on Hungarian Peasant Songs op. 20 was written in Budapest in 1920. As the title unmistakably indicates, Improvisations is not a collection of mere song arrangements but rather eight pieces of the composer’s own invention, each based on a different song. Indeed, Bartók went beyond research. “The substance of the recasting weighs more than that of the original” (Klaus Billing). Since Stefan Arnold became an exclusive Ambitus artist, this collaboration has produced eleven recordings with works by Liszt, Brahms, Schubert, Beethoven, Mozart, Schumann, Debussy, including Mozart’s Piano Concertos Nos. 12 and 14. 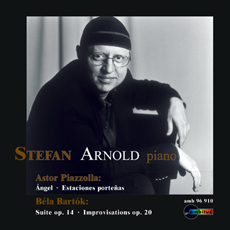 In 2004 Stefan Arnold was appointed Professor at the Piano Performance Department of the University of Music and Dramatic Arts in Vienna.